The EnergyCloud Service subscription costs $3.95/month ($39.95 if paid annually) and includes full access to all the EnergyCloud Service features for a single electricity meter. You will receive a notification approximately 60 days before your current subscription expires. For plans that are paid monthly, the amount will be charged to your credit card automatically each month until you cancel your subscription. There is no refund for partial months. For plans that are paid annually, the amount will be charged to your credit card the day before your current subscription expires. You may cancel your subscription at any. You will receive a refund equivalent to 1/12 of your annual subscription cost for each remaining whole month. Full access to the EnergyCloud Web Portal for all information panels including Right Now power, Monthly Comparisons , Consumption History , Appliances and Tips . The EnergyCloud Service subscription costs $2.95/month ($29.95 if paid annually) and includes full access to all the EnergyCloud Service features for a single electricity meter. You will receive a notification approximately 60 days before your current subscription expires. For plans that are paid monthly, the amount will be charged to your credit card automatically each month until you cancel your subscription. There is no refund for partial months. For plans that are paid annually, the amount will be charged to your credit card the day before your current subscription expires. You may cancel your subscription at any. You will receive a refund equivalent to 1/12 of your annual subscription cost for each remaining whole month. How does the EnergyCloud solution work? We gather two types of information: information that is submitted to us and information that is not submitted to us. By submitted, we mean any information volunteered to us by the completion of an HTML/Server generated form, or mailed, phoned or faxed to us. (1) There are two types of information we collect that users submit: public and private. We define private information to be any information that allows others to contact a user or allows the collection of information about the user other than what is displayed on the site. Public information is personal information that may be displayed on the site, such as gender, age and height, but cannot be linked to a particular user. (2) PRIVATE: This information is gathered from members and guests who register for or purchase various services or products our site offers. This information includes e-mail addresses. It also includes, but is not limited to, for billing or payment purposes, first name, last name, credit card number, and personal or business address. (3) PUBLIC: We may gather personal information such as gender, age, demographic data, and more. This information cannot be linked by visitors to any private information. This is information we collect that is not personally identifiable, such as browser type and IP address. This information is gathered for all users to the site. (1) PRIVATE: We may use a user’s e-mail address to send news regarding our site, but the user may choose not to receive e-mail of this type by contacting us as specified below. E-mail addresses may also be used in private correspondence with the user for customer service issues. We will use the personal data you input during the registration process to administer access to the site. Financial information that is collected is used to bill the user for products and services. All other private information submitted by the user is confidential. All private information can be updated or deleted by the user at any time. (2) Information submitted by a Business Affiliate is used for establishing and maintaining a business relationship. No personal or business information is shared outside the relationship between a Business Affiliate and ourselves. Business Affiliate may not view or access private information on members or users of our site or the Business Affiliate Site. A Business Affiliate may change their personal or business information by contacting us at as specified below. (3) PUBLIC: This site may use public information and pool it with other information to track, for example, the total number of visitors to our site and the domain names of our visitors' Internet service providers. It is important to note that no personal data is available or used in this process. We use your IP address, server and browser-related information to help diagnose problems with our server, and to administer our Web site. We do not sell, rent, share, trade or give away any of your personal information except to the financial institution that processes your credit card or cheque transaction. If, at any time after registering, you change your mind about receiving information from us or about the use of information volunteered by you, please send us a request specifying your new choice. Please contact us as specified below. If you have any questions about this privacy statement, the practices of this Site, or your dealings with this Web site, you may email us. When you access this site, you acknowledge that you have read and agree to abide by the terms described below. If you do not agree to the terms discussed here, you should exit this site now. (c) copies of any material include Copyright Holder’s copyright notice. The Copyright Holder’s logos are trademarks or service marks of Copyright Holder. You may not use these or any other Copyright Holder’s trademarks or service marks without the written permission of Copyright Holder. COPYRIGHT HOLDER AND ALL CONTENT PROVIDERS MAKE NO REPRESENTATION ABOUT THE SUITABILITY OF THE CONTENT HEREON. THIS SITE, AND ACCESS TO ANY LINKED SITE, IS PROVIDED TO YOU BY ALL CONTENT PROVIDERS “AS IS” AND “AS AVAILABLE,’ WITH NO REPRESENTATIONS OR WARRANTIES OF ANY KIND, EITHER EXPRESSED OR IMPLIED, INCLUDING, BUT NOT LIMITED TO THE IMPLIED WARRANTIES OR CONDITIONS OF MERCHANTABILITY, FITNESS FOR A PARTICULAR PURPOSE, ACCURACY, AND NON-INFRINGEMENT. YOU HEREBY DISCLAIM ALL WARRANTIES BY COPYRIGHT HOLDER RELATING TO YOUR SITE USE. YOU ACKNOWLEDGE THAT YOUR ACCESS TO THE SITE WILL NOT BE FREE OF INTERRUPTIONS, THAT THE INFORMATION HEREIN MAY CONTAIN BUGS, ERRORS, TECHNICAL INACCURACIES, PROBLEMS OR OTHER LIMITATIONS, AND THAT THE SITE MAY BE UNAVAILABLE FROM TIME TO TIME. YOU ASSUME TOTAL RESPONSIBILITY AND RISK FOR YOUR SITE USE AND SITE-RELATED SERVICES. Copyright Holder is not liable for any direct, indirect, special, incidental, or consequential damages arising out of or in any way relating to the site, your site use, or the content. This includes but is not limited to the loss of data, loss of profit, or litigation, even if Copyright Holder was advised of the possibility of such damages. Your sole remedy for dissatisfaction with the site and/or content is to cease all of your site use. While this Web site may contain links to third party sites, Copyright Holder is not responsible for the content of any linked sites. Copyright Holder provides these links as a convenience and does not endorse the companies or contents of any linked sites. Copyright Holder is not responsible for any material posted on our Forums. You are prohibited from posting or transmitting any unlawful, threatening, obscene, libelous, or otherwise offensive material. You agree to indemnify Copyright Holder and its officers, directors, employees, agents, and affiliates from and against any and all third party claims, demands, costs or expenses resulting from your breach of the foregoing. Any material, information, or idea submitted or posted on this Web site will be considered non-confidential and non-proprietary. Copyright Holder may share or otherwise use your submission for any purpose whatsoever. If any of the information submitted constitutes personal data, you agree that Copyright Holder may transmit such personal data across international boundaries for any Copyright Holder business purpose. Personal data will be treated as set forth in our Privacy Statement. No content from this site may be downloaded in violation of any Canadian law. Nor may any content from this site be transmitted or exported outside of North America. All claims or issues regarding this Web site shall be governed according to the laws of Province of Newfoundland and Labrador. Any legal action concerning these Terms or this Web site must be brought within two (2) years after the claim or cause of action arises and must be brought in the Province of Newfoundland and Labrador. If you are not completely satisfied with your Blue Line Innovations product you may return it within 30 days for a full refund, including return shipping. The product must be in its original condition and returned in original packaging with all contents included. Upon receipt and inspection of your return, Blue Line will issue a full refund of your original purchase price. Refunds cannot be processed for products that are damaged or missing components. Allow 7-10 days for your refund to be processed. Returns may be requested at orders@bluelineinnovations.com. to refund the purchase price in respect of any product that is found to be defective and that is returned, with its proof of purchase, to the original supplier. This warranty excludes and does not cover defects, malfunctions, or failures caused by misuse, unauthorized repairs, modifications or accidental damage. Note: This warranty does not apply to batteries or damage to the product caused by the use of faulty batteries. Warning: Changes or modifications not expressly approved by Blue Line Innovations Inc. void the user’s authority to operate the equipment. This warranty is only applicable to a product purchased through a Blue Line Innovations authorized dealer. In no event shall Blue Line Innovations be liable for consequential or incidental damages. This warranty is in lieu of all other expressed warranties. The duration of any implied warranty is limited to the period of the expressed warranty set forth above. Studies prove that changing consumer behaviour regarding energy consumption is directly related to the awareness of the public via education, and by making energy data readily available. 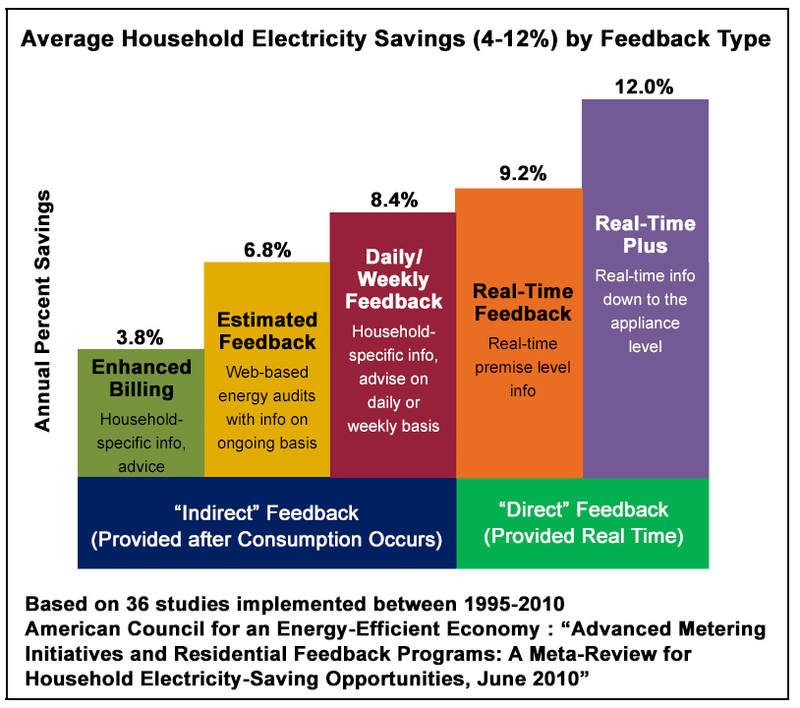 In order to reduce electricity consumption, accurate real time data must be available to homeowners and this has been studied extensively. This is the driving force behind Blue Line Innovations' philosophy and approach. Alberta Innovates Technology Futures study concludes homes using the EnergyCloud reduced electricity consumption by 9% overall and up to 16.7% for those with electric hot water heaters. The three year electricity consumption data for all participants was normalized based on the weather and survey data using a statistical algorithm. The EnergyCloud system, comprised of the Blue Line’s patented meter sensor, CloudConnector gateway and the EnergyCloud app, is a comprehensive electricity usage monitoring solution for your home or small business. EnergyCloud provides the up-to-minute information you need to reduce your electricity costs. © 2019 BLUE LINE INNOVATIONS INC.